Update–March 5, 2015. Have taken on an artist as a part time apprentice, and she is great for bouncing ideas off of. She comes on Wednesday. I keep thinking her name is Pam and she keeps saying Tina when she calls. I am an idiot. Saturday, a leather worker who needs some space is coming by in response to my ad looking for a knifemaker. I explained the metalworking angle (not getting help on the rent) is the purpose for sharing some of the space, but if she had occasional projects like needing a big table to cut out a hide or make smells with glue, I’m okay with that. We’ll talk and see what we can figure out. New friends at the studio–Don’s been by twice, he does neat one-off birdhouses using a lot more woodworking skill than I possess. A thrift-shop friend came by and brought me old wood, met a crafter at the Golden Hobby shop when I was dropping off product and she needs buttons so she’s stopping by soon. 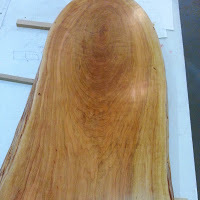 A young artist couple visited to look at wood I had on Craigslist and we seem to hit it off well, I loaned him a Mbira to study and copy, since he loves to turn instruments from Osage Orange I didn’t think a mbira would present him much of a challenge! I also set up an area that will have a large heavy-duty rack built on it for people to see large slabs of wood from a local lumber processor. I’ll build a web site for selling it and have screened 12 movers down to three that will get appointments to see the product as soon as it’s installed. 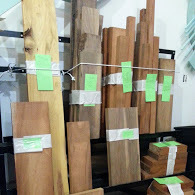 There are very few places to get really premium slabs for woodworkers to turn into heirloom furnishings, because it’s more than just a big slice of wood–how it is dried, the lay of the grain, handpicking for the most interesting pieces–it’s a retail challenge to get the best stock standing in the studio. Then you need to market and match those slabs to buyers willing to put in the time and skilled labor to turn rough material into finished product. I also met a couple woodworkers who came in for some mahogany I put on Craiglist, and we ran our hands over some osage slabs and had a nice chat. Told them they were welcome to stop by any time. It was nice to meet a couple of young’uns (maybe 30?) who had the fever to learn new things, study how to make things, work with their hands. One had some welding experience, the other woodworking and other skills. Good start on a life filled with challenging activities. More books arrived to study with my coffee this quiet cold Sunday morning. January 1, I joined up with a closed group on Facebook to network with knifemakers, since I seem to be dancing on the periphery of their work with the knife stands, handles, and soon display boxes. I also connected through that site with a knifemaker in Kentucky who is just getting started in the business, and has access to wood, so we’re going to swap wood for scrap metals I’ve been coming across and bandsaw blades that are hanging around the shop (knife makers like bandsaw blades for folding and forging knife blades). Every contact is important and you just never know where things may lead; one of my best wood customers is coming today with his planer and doing a few hours’ work in exchange for lumber. If I ever get a large contract and need help, Dave will get the first call to see if he wants to put in some hours!